Last week Fermanagh Miscellany 2014: A Decade of Turmoil, an eighth collection of writings by members of Fermanagh Authors’ Association, was released as an ebook. The print edition of the book sold out very quickly when it was released last December. 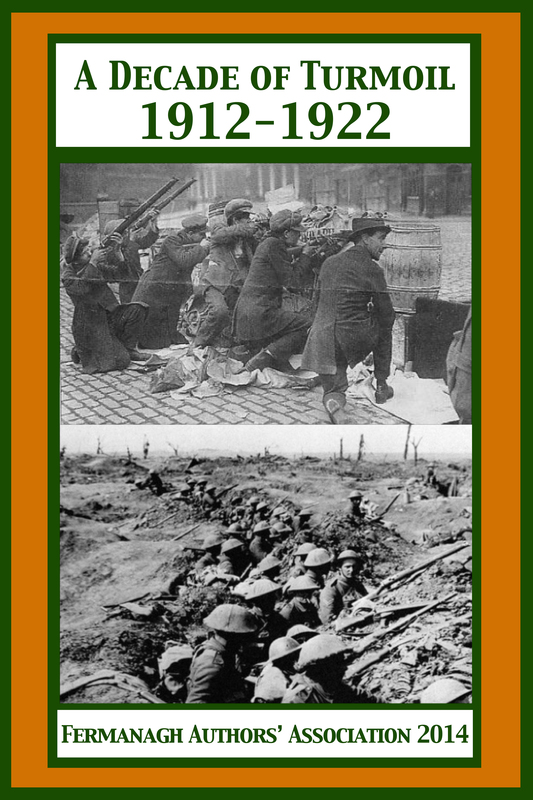 The contributions to the anthology all focus on events which happened in Ireland during the years 1912 to 1922, a significant decade in Irish history. The island of Ireland is presently remembering that decade in many centenary events, known collectively as the Decade of Commemorations. Historic events being commemorated include the signing of the Ulster Covenant (1912), the sinking of the Titanic (1912), the Plantation of Ulster (1613), the First World War 1914 -1918 and the Treaty of Versailles (1919), the Easter Rising (1916), the Battle of the Somme (July 1916), the rise of the Labour Movement including the Belfast strike in 1917, universal male and limited women’s suffrage (1918), the General Election (1918), the War of Independence (1919-1921), and the Irish Civil War and Partition of Ireland (1922). I have been a member of Fermanagh Authors’ Association for several years and enjoy contributing eclectic material to their yearly publications. This time my offerings are an excerpt from my historical novel, Hitler and Mars Bars, that relates to the Great War, and The Letter, a short story I wrote about a small act of defiance in a country village in support of women’s suffrage. Fermanagh Miscellany 2014: A Decade of Turmoil is available on Amazon US & UK. This entry was posted in October 2014 and tagged Dianne Ascroft, Dianne Trimble, ebooks, Fermanagh, Fermanagh Authors Association, Fermanagh Miscellany, Fermanagh Miscellany 2014: A Decade of Turmoil, John B Cunningham, Seamas MacAnnaidh, Vicky Herbert. Bookmark the permalink.